Detailed information regarding Pharmaceutical MBA like fees, scope and colleges providing these courses? Re: What is the scope of MBA in pharmaceutical management? Yes !! good to hear that you like this course ..
think that this line would not suits to them . There are numerous jobs available for a qualified person in the Pharmaceutical sector. With the growth in the number of nursing homes, hospitals and pharmaceutical companies in the country, the prospects for jobs are on the rise too. People who are working in the field of pharmacy can also start their own business if they like. Not only can pharmacists work with research establishments, teaching hospitals and departments of the government, but also they can find work with investigating agencies, armed forces and other related fields. The food and Cosmetics sector also take in students of Pharmacy. As a matter of fact, the job opportunities for Pharmacists can be found in India as well as abroad. Details on the jobs available in the pharmaceutical sector are given below. In this field, the salary will depend upon the field the pharmacist has chosen. The initial salary of a pharmacist will be as mush as Rs 4,000 each month. Those who are occupied in the field of research will get around Rs.10, 000 – Rs.40, 000 a month depending on the institute and area of research. Medical Representatives will receive Rs. 5,000 – Rs. 10,000 a month in addition to incentives and Hospital Pharmacists will get around Rs.3, 000 – Rs.5, 000 each month. The remuneration of pharmacists who are employed with the manufacturing department of the government will amount up to Rs. 5,000 and above. Apart from the basic salary, they will also receive DA, Medical reimbursement and Insurance in addition to other allowances. One of the best part of this job is that Pharmacists will get to travel to exciting places. The reason to this is that they will be asked to study about medicinal plants and the regions they can be found. On top of this they will also be asked to attend pharmaceutical conventions all across the globe. Another good thing about this job is that, freshers can get jobs almost immediately after they graduate. 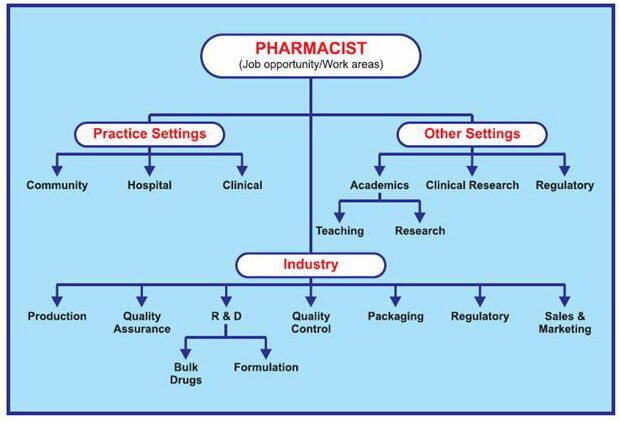 Pharmacy is a profession where one can not only make more money but also can get respect from people of all sectors. Finally, the most attractive feature of this job is that the pharmacists will be able to set their own business quickly. Some of the disadvantages that are seen in pharmaceutical are that individual will have to travel a lot and on top of this, they will never be any fixed timings for them. To have an up to date knowledge about each and every medicine in addition to their uses, side effects etc is one of the many responsibilities of a pharmacist. He will be required to learn about new medicines. This can be considered as one of the shortcomings of pharmaceutical sales. Another drawback of this job is that pharmacists need to work for long periods of time. Even though they will be able to choose their working times, the time they put into their work will be much longer when compared to the time they get to relax. 9.Regulatory Affairs & IPR .